Bible boxes, but set upon stands embellished with turned legs and such decoration as carved skirts and brass fittings. This type was quite functional; the top compartment of a desk-on-frame could be lifted off and used elsewhere. The lid was often slanted and would be flipped up to store materials underneath—a form seen later in schoolhouse desks. 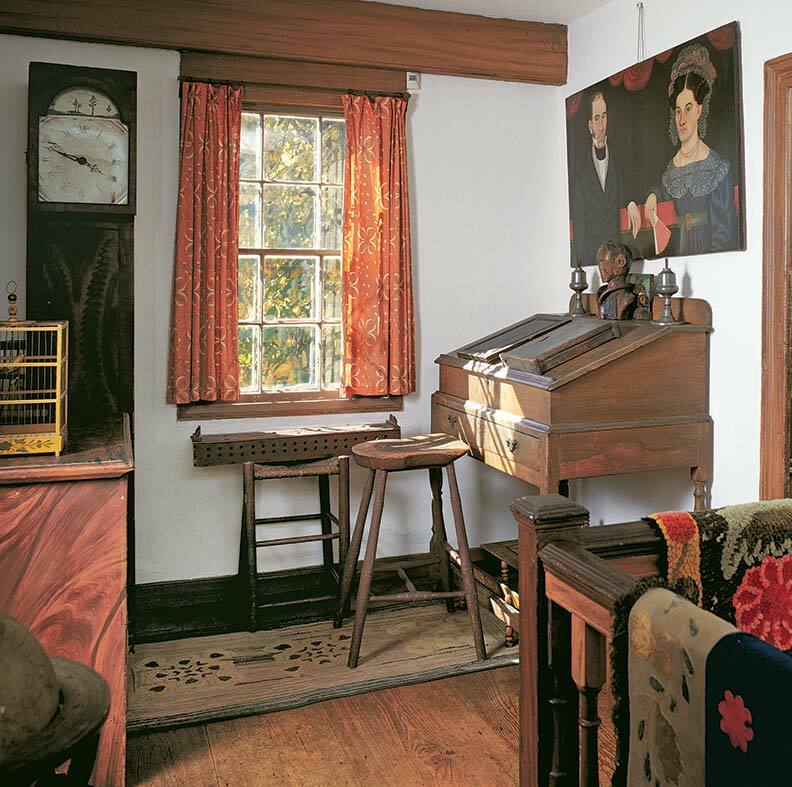 Drop-front desks were a variation of the escritoires—simple desks with hinged lids. They provided a good spot to write when dropped open; when the lid was closed, it hid the drawers and compartments inside. It was bothersome to have to remove everything from the lid before opening it, and so slant-front desks evolved with lids that opened forward. Styles included the early Baroque William and Mary style, often with a drawer beneath the top; the very popular Queen Anne style featuring graceful cabriole legs; and—for those who could afford it—the more elaborate Chippendale style with its carvings and ball-and-claw feet. With economic prosperity and the rise of the middle class, the culture of correspondence made letter-writing a favorite leisure activity. 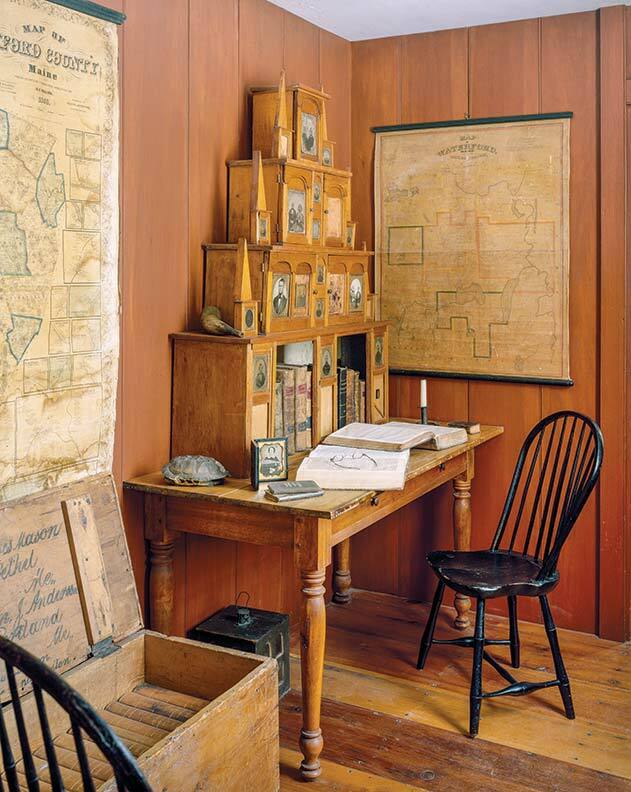 The need arose for larger desks to store the plethora of printed materials—from books, letters, and calling cards to pamphlets and periodicals. The secretary (from secretarius, Latin for writer) evolved as a larger and more formal piece of furniture to store books and papers. 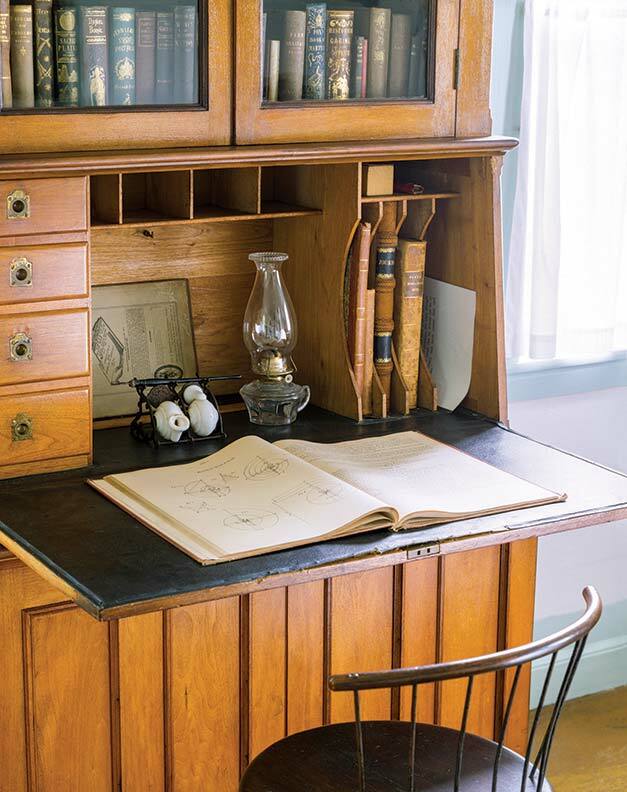 Tall or low, a secretary consists of a slanted lid that flips forward to create a writing surface, concealing (when closed) cubbies and pigeonholes (even secret compartments) and drawers. Above, drawers or a cabinet with molded or glazed doors allows display space for books and export china. The top of the cabinet might be plain or highly embellished with carvings, finials, and pediments. A wide variety of secretaries were made, from basic pine desks crafted by local cabinetmakers to finely detailed examples made by famous furniture-makers of the period, such as Goddard and Townsend and Duncan Phyfe, in styles including Chippendale, Hepplewhite, and Sheraton (named for English cabinetmakers whose books were highly influential). The high-style secretaries were built of such fine woods as walnut, mahogany, and tiger maple. The glass cabinet doors had muntins in designs like Chinese fretwork and Gothic arches. The tambour desk is a variant on a low secretary, a desk on legs topped by a low cabinet with a sliding tambour that could be pulled down to hide drawers and pigeonholes inside. 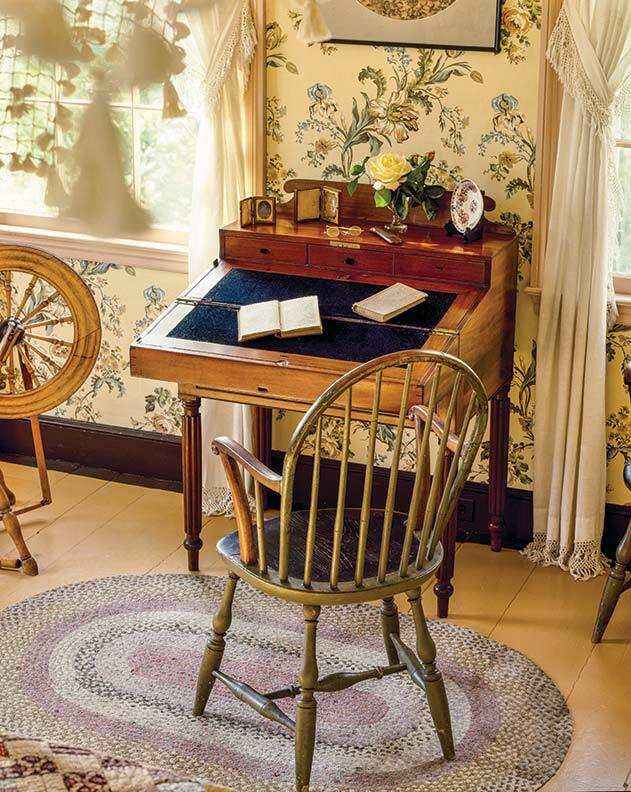 Smaller and more compact than a tall secretary, the tambour desk was easy to place in the parlor or study. As the nation prospered, desks were becoming de rigueur for wealthy homeowners, as a statement of one’s education and good taste. 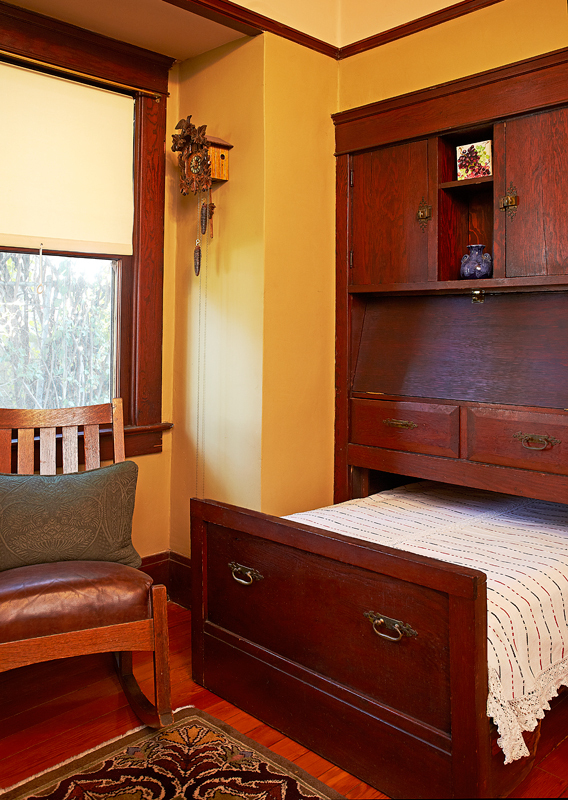 Bureau desks are covered desks with drawers underneath on either side. Derived from chests, they originated in France. These desks provided more drawer storage. They were described by the shape of the front surface: straight-front, bow-front, and serpentine (with S curves). Kneehole desks (common today) were the obvious evolution of the bureau desk. 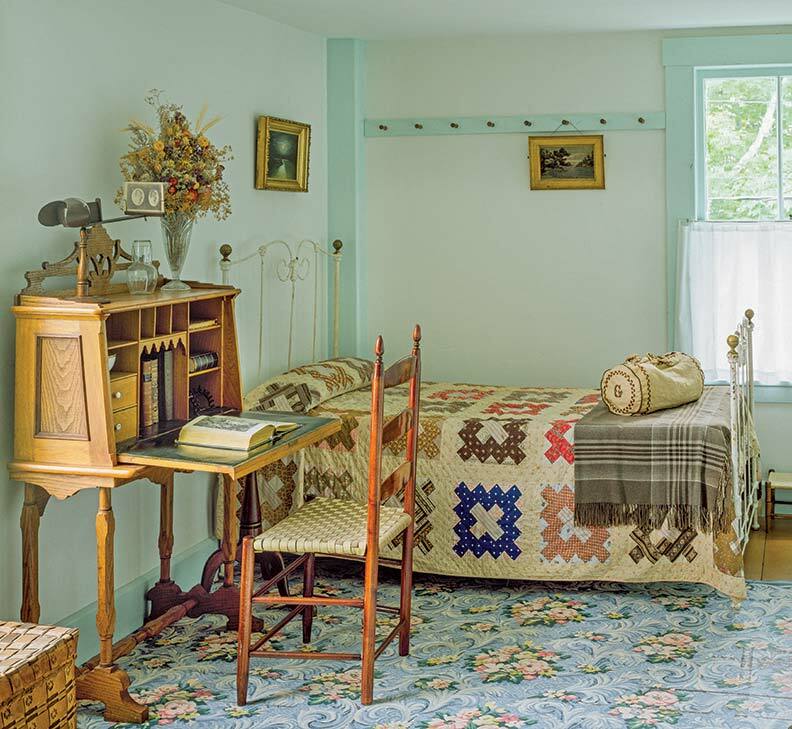 The center space, or kneehole, made it easier to sit up close to the desktop without turning to the side, a boon especially to women, with their voluminous skirts. 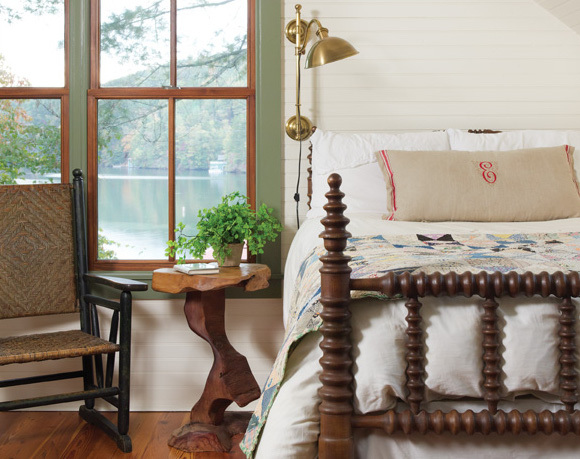 Common details included serpentine fronts, drawers fitted with brass pulls, and claw feet.